Neopaque shares many characteristics with Lumiere but is formulated with traditional pigments instead of metallics. A great companion to Textile Color for black fabrics, these super opaque paints provide maximum coverage on virtually any dark ground. Exceptionally washfast on fabric, Neopaque is also permanent on a wide variety of other surfaces, including leather, vinyl, canvas, stone, plastic and rubber. Professional shoe painters depend on Neopaque for its superior durability and adhesion to non-traditional surfaces—it won’t crack, peel or chip, even with continuous wear. 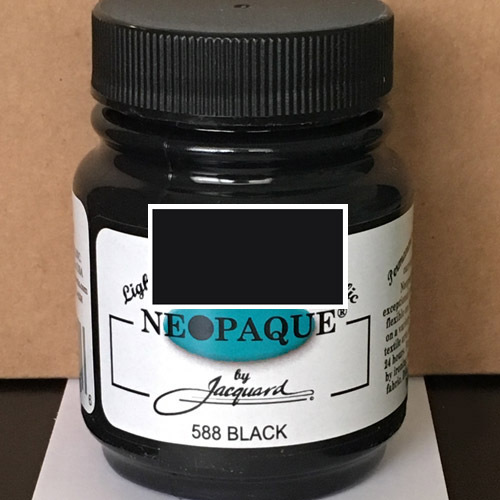 Great for fine arts, textiles, leather and more, Neopaque is unsurpassed for coverage, versatility and performance.